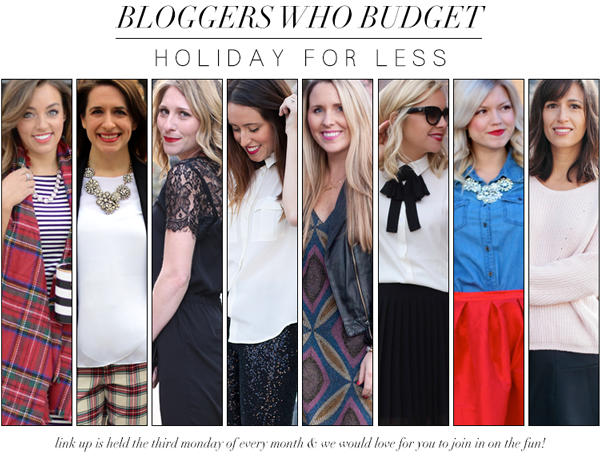 We’re back for another installment of Bloggers Who Budget! Today we’re featuring Holiday pieces for under $75 and I’m so excited to show off a recent My Kind of Lovely favorite! You really can’t beat a little holiday dress for $60. This week the tights were necessary but I also can’t wait to wear it with these otk boots! Don’t forget to check out all the other BWB ladies below and we can’t wait for you to join the link up! The Bloggers Who Budget ladies would like you to join in on the fun every 3rd Monday of the month, starting 8 AM EST! The BWB link-up is all about sharing how you shop on a budget. Each month will have a theme, which will be announced ahead of time. We want YOU to join in the fun of styling something around our monthly themes & can’t wait to see it! I LOVE that dress. You look amazing- this one of my favorites of yours. This dress is stunning! I love the simple cut, and the colours and pattern are amazing! Great leather jacket too. Those shoes are perfect for this time of year!